So it’s always a pleasure when you work with a ‘link nirvana’ client. ‘Link nirvana’ is when a business/website gets links naturally, without even trying. It is a dream – a ‘holy grail’ on the link building front – that very few businesses achieve. I’m very lucky to work with a business who fit this description. 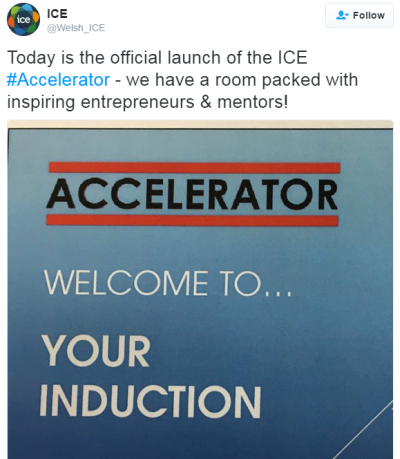 Welsh ICE (Innovation Centre for Enterprise) is a coworking space / business centre / startup hub / incubation centre in South Wales (just outside Cardiff). 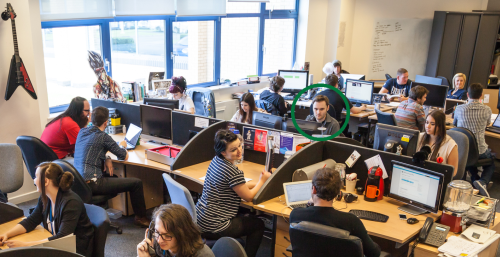 I’ve been based there for three years – pretty much ever since going self-employed as a solo consultant – and after a while they approached me to help with their SEO on an on-going basis. Despite being based in Caerphilly, which isn’t strictly Cardiff (it depends on who you ask…! ), they’re starting to rank on page 1 for “[keyword] cardiff” keywords, despite competition from other similar initiatives and ‘big guns’ like Regus. The thing I love about ICE is that they are a PR machine. The press loves them! They do and say all the right things and get the attention – and links – for it. Beyond that, they get a lot of links from a variety of different (and authoritative) sources. It certainly makes my life easier, freeing me up to concentrate on on-site/technical/copy considerations than anything major off-site. I’ve mentioned before about how ICE was getting links by running events – even before they started considering SEO. They don’t even necessarily run all the events themselves: they also provide event venue hire as a service and so people come in from outside and use the space, running the events themselves. It often leads to links because – at the very least – the event hosters link to ICE so that people can learn more about the venue (where it is, how to get there, etc.) and also when promoting their events to their prospective attendees. In fact, one of the events that ICE runs is called Step 1, where they get organisations offering business advice, financial support and job creation schemes – including local council and government initiatives – in one room to help fledgling businesses. 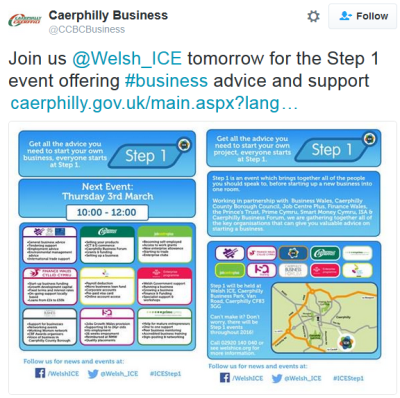 Many of the ‘partner’ organisations that are involved promote the events via social media and from their websites, complete with – oh, you’ve guessed it – links to ICE. If your clients are partnered with any organisations, are they promoting you appropriately? I’m not just thinking of the old-school ‘reciprocal link’ mentality of yesteryear – think beyond that. Can you blog for them? Can they blog for you? Can you support them in their marketing efforts further? Take it further if you can. Along with links from .ac.uk sources (we’ll cover that next), links from .gov.uk sites are some of the most coveted that someone can get. 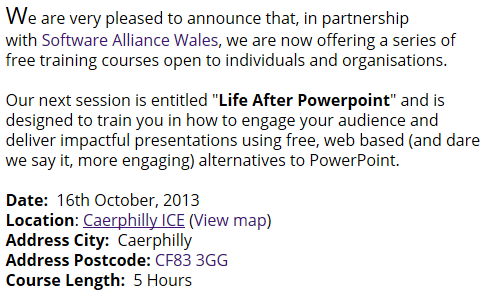 One of ICE’s links is from businesswales.gov.wales for their involvement supporting a programme that supports businesses with high growth potential – “to deliver joint events and facilitate their premises for master classes and coaching sessions” (source). They were even mentioned in a Welsh Assembly debate the other day for their contribution to the Welsh economy. Nice. Bear in mind that ICE didn’t go into this with the SEO benefit in mind as the primary objective. They just ‘did’ it. Simple as that. Similar to .gov.uk domains, university websites (i.e. .ac.uk domains) are also seen as link building gold-dust. 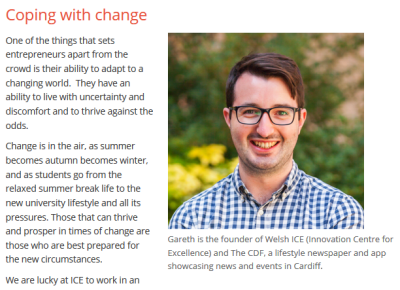 Fortunately for ICE, three of the major South Wales universities – cardiff.ac.uk, cardiffmet.ac.uk and swansea.ac.uk – are linking to them. They didn’t do a specialised campaign – such as a cheesy (and dare I say lazy) ‘win an iPad’ type giveaway or anything like that – in order to with the hearts of the uni webmasters… One of them linked because they ran an event where students could get a taste of entrepreneurship, developing and pitching an idea as part of a team in a 24-hour period. One of them linked because they offered a shadowing scheme for 12 students to shadow ICE-based businesses. One of them linked because ICE’s CEO wrote a guest blog post especially for them. I’ve seen SEO campaigns specifically targeting universities that have failed spectacularly – I know of one that I think targeted and conducted outreach to about 70 UK universities and I don’t think it resulted in a single link. Instead these guys put on an event (again, tying into #1 above) and run other similar student-focused schemes and in turn they get three different universities promoting them to their students on their behalf. They are selfless, altruistic activities that genuinely helps people – and they have been rewarded with links accordingly. Many digital marketers – SEOs especially – may remember Wil Reynolds coining the phrase ‘real company sh*t’ (here’s the video if you missed it or want a reminder). ICE is most certainly doing real company sh*t – and it’s a delight to see the results of their hard work filtering into their organic off-site SEO efforts completely naturally. Now I completely appreciate that they’re one of those one-of-a-kind cases, and I certainly don’t want to come across as either preachy or humblebraggy in this post… Heck, even from my own experiences, for every business like ICE there’s another who expects SEO to be an effortless wand-waving exercise. But when working with your clients, ask them the question: what are they doing to help the economy / help younger generations / help their industry / help the local vicinity? Even if they aren’t necessarily doing something that coincides with one of the four points I’ve mentioned above, maybe it’ll lead to that exciting ‘light-bulb moment’ and you’ll have an idea of something that they can do that’ll fit similar criteria – and get them a bunch of juicy links in the process. The important thing to remember in ICE’s case is this: they don’t have to do half of what they’re doing. There are other business centres and coworking spaces in South Wales that don’t offer a fraction of the support that ICE offers to the local entrepreneurship and freelancing community (myself included). Whether it’s Step 1 (mentioned above), GRIT (a series of weekly workshops each covering a different entrepreneurial subject), the 5 to 9 Club (intended for people who want to start their business alongside a full-time job) or something else, it’s the fact that they make an effort and actually give a damn that gets them noticed and gets them links. Sure, it’s not easy – it’s a lot of hard work for them and it’s often quite stressful. But you get what you give. Based on the above examples from ICE, can you or your clients be doing some of the following? Run industry events, whether they be regular meet-ups or an annual conference? Run events that benefit students/graduates or small business owners? Can you hold events at your office? For example Unified Diff (a Cardiff meetup for developers) is now run out of a startup’s office rather than in a more traditional venue. Offer mentoring to small businesses and startups? Guest lecture at your local universities, colleges and schools? Hire staff through ‘jobs growth’ initiatives, or provide apprenticeships or internships? What about you? 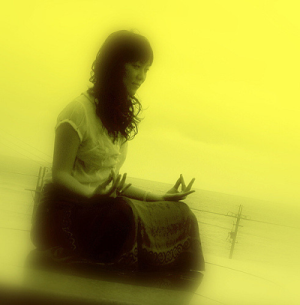 Do you have ‘link nirvana’ clients? What are they doing that’s earning them links? Is there anything that we can learn from them? Please share your experiences in the comments below!